Guard tower at the Lorton Reformatory by Forsaken Fotos licensed under Creative Commons. The Lorton Reformatory is a prison in Lorton, Virginia about 19 miles outside of DC that closed in the late 1990s. This May, it officially reopened as a sprawling complex of apartments called Liberty at Lorton. It's a great example of how a historical site can supply housing in a region that badly needs it, while still preserving a landmark with a storied history. Over the summer, I toured the grounds and discussed their history with Jack Perkins, Vice President at Elm Street Development and the lead developer of the project. Perkins is a local history buff, and he shed a lot of light on how Elm Street and the Alexander Company, which was in charge of historical preservation during the redevelopment, transformed the prison into housing. The Lorton Reformatory opened in 1910 and was called the District of Columbia Workhouse. It was part of the DC prison system, which was itself under the management of the Federal Bureau of Prisons. The prisoners were mostly alcoholics, thieves, and other people given short sentences. Once sentenced in DC, they would be transported to Lorton for incarceration. View from the Lorton Reformatory quad, taken in 2013 by Fairfax County licensed under Creative Commons. People imprisoned at Lorton learned trades like metalworking and brickmaking, and their time was spent laboring and making goods for the prison and region. A 1918 report from the prison Superintendent W.H. Whittaker to George S. Wilson, the Secretary of the Board of Charities, called the prisoners “unfortunates” who were considered “scrapheap material,” and said that the lack of “prison atmosphere” has helped rehabilitate them. Soon, the prison added a women’s workhouse in 1912, a juvenile facility, and a maximum security penitentiary in 1935. Adding a maximum security facility helped the prison change from being primarily for non-violent criminals serving their time to keeping violent criminals from society on a long-term basis. This included The Hole, a set of cell blocks that acted as solitary confinement. Inmates there were allowed to leave their cells for only one hour a day. Lorton Reformatory cell blocks. Image by Fairfax County licensed under Creative Commons. Perkins said that during excavation they found old license plates and other items inmates made there for the prison’s use and for sale. Women incarcerated in the women’s workhouses would learn how to cook, sew, and do laundry for the prison. From the 1950s to 1970s, the US Army used Lorton prison land for one of numerous Nike missile sites around the country (including three in Fairfax County). These sites, erected during the Cold War, housed Ajax anti-aircraft missiles and Hercules nuclear missiles that could be launched at a moment’s notice to stop any Soviet attack and act as a deterrence. The prison also became a farm. At its height of operation in the 1940s to 1960s, the farm had a herd of cows and inmates were raising chickens and turkeys. They also produced dairy products and fished from the Occoquan River. To help move materials and prisoners throughout the prison site, the prison constructed a railroad in 1910. It ran for about 11 miles and its sole purpose was to service the prison. It connected the reformatory, workhouses, the brickyard, and the Occoquan River, and was in use until 1977. A map of the Lortom and Occoquan Railroad. Image by Fairfax County. Today, only a very small part of the railroad is left and it can be seen in front of a brick kiln, preserved at Occoquan Regional Park. 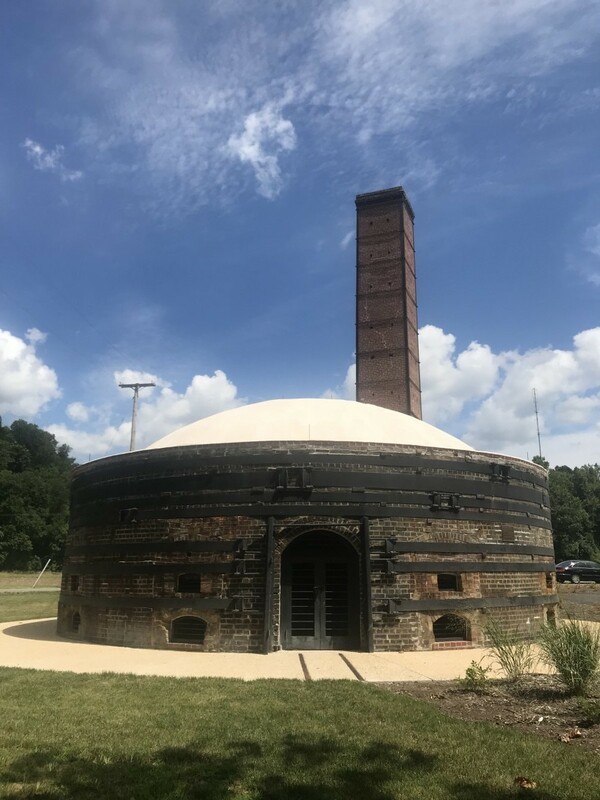 One of the brick kilns, preserved at Occoquan Regional Park. Image by the author. In November 1917, Lorton became notorious for imprisoning the “Silent Sentinel” suffragettes like Dora Lewis and Lucy Burns, who had protested for the right to vote. At the Occoquan Workhouse, they were abused and chained to cells. Their food was rotten and had worms in it. When they protested their treatment by going on hunger strikes, they were force-fed. Their work toward voting rights for women, and being outspoken about poor treatment at the Occoquan Workhouse, helped secure the 19th amendment to the Constitution in 1919. Lucy Burns. Image by Library of Congress. The suffragettes weren’t the only notable inmates — music was also a big part of the Reformatory. Chuck Brown, the “Godfather of Go-Go,” did an eight-year stint in Lorton for murder in the 1950s, and while incarcerated, learned the guitar. In the book The Beat! : Go-go Music from Washington, Brown said that Lorton had contributed to his rehabilitation, and that he found support for his music there. Ralph Waldo “Petey” Greene Jr., a local legend, spent several years at Lorton Reformatory in the 1960s for an armed robbery. There, he became a DJ for the prison station, 88.1 WLOV. After his release he spent the next two decades of his life as a radio host and activist. Chuck Brown, the “Godfather of Go-Go” performs with Thievery Corporation in DC. Image by Mark Taylor licensed under Creative Commons. There were many notable visitors, too. Ella Fitzgerald, Frank Sinatra, and Count Basie brought down the house in 1965, where they performed from the baseball diamond at Lorton Reformatory's very own jazz festival. When the baseball fields weren’t being used for famous singers, they were home to the reformatory's prison sports teams. The prison had two fields, including one dating back to 1925. On the diamond, prisoners would play alongside guards and community members — and there would be both black and white players together, something notable during the time of Jim Crow and segregation. Though Elm Street was able to overhaul one field (the one Sinatra, Fitzgerald, and Count Basie sang on), the oldest field near the Workhouse Arts Center is still mostly untouched. One of the Lorton Reformatory's gymansiums, now converted to housing. Image by Beekeeper Group used with permission. Basketball was also a popular sport, particularly in the 70s through the 90s. The prison had multiple indoor and outdoor courts where players could participate in what one prisoner later described as “Lorton Ball,” a way for prisoners to show dominance and shift the internal power structure. 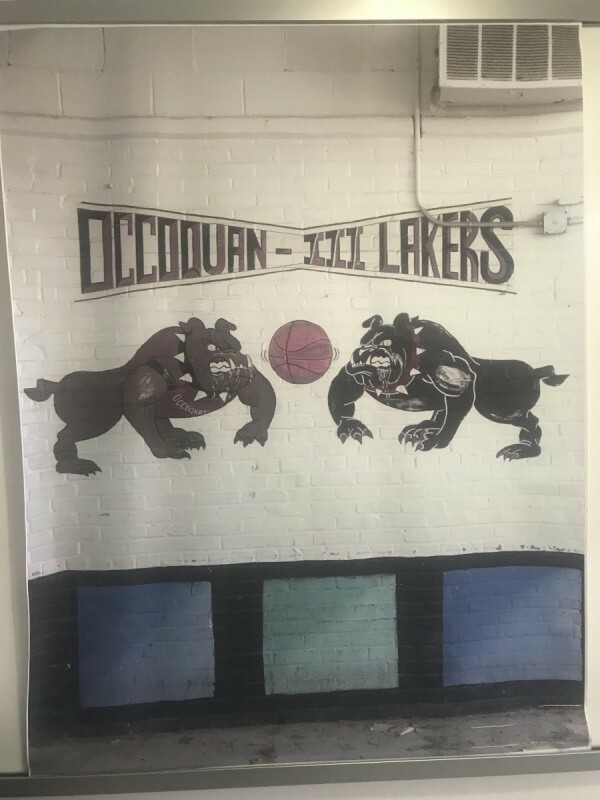 A photo of a mural that was in one of the old gyms, labeled ZN 3 near the Workhouse Arts Center. 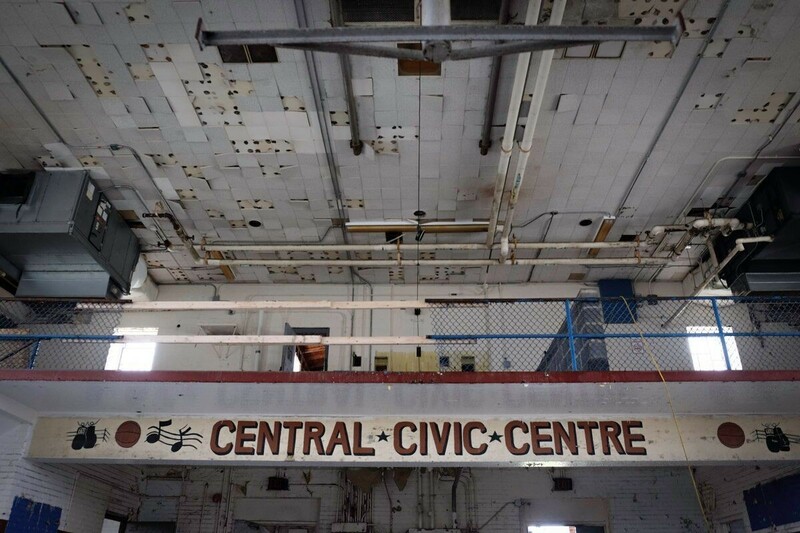 The gym is shuttered and being used for storage, and the mural can still be seen on the walls, though it is missing paint and faded. Image by the author. “The proximity of Lorton to the District of Columbia allowed the prisoners to maintain ties to the community and nurture ongoing relationships with family and friends,” according to Nancy Shia, who documents oral histories from Lorton prisoners through the Lorton Prison Stories Project. The photographs on the project’s website are from the 1970s and focused on the medium security wing of the prison. They depict inmates and their family members spending time together and community events. If not for the barbed wire and guards, erected in the 1950s, one might have mistaken the environment to be genial. In hindsight, the mindset of emphasizing rehabilitation versus locking up prisoners (albeit through prison labor) had been chipped away almost from the beginning — first, when the maximum security facilities opened in the 1930s, and again when fences were added to the prison perimeter in the 1950s. A power plant at Lorton. Image by Forsaken Fotos licensed under Creative Commons. Lorton had been famous for being a prison “without walls,” but slowly gained them over time. The increasing security at Lorton Reformatory transformed the space, removing it from the Progressive Era’s original ideas for reform and more toward outright imprisonment. Proponents of the Lorton Reformatory model presented it as an “ideal” — prisoners who worked hard and kept out of trouble during their sentence would gain valuable skills upon release. However, the prisoners hardly had any choice in becoming laborers and were not meaningfully compensated for their work (much like today). Old kitchen equipment in the Lorton Prison kitchen. Image by Fairfax County licensed under Creative Commons. As the decades went on, this perspective faded. According to former prisoners like Stewart Anderson, prison work was voluntary on paper but since prisoners who worked got slightly better food as an incentive, it conditioned prisoners to work for little to no pay. Pay amounted to about $17 a month. There were numerous uprisings throughout the 70s to 90s, including a hostage situation in 1974. Inmates even set buildings on fire. Today we can see where some of the buildings were damaged because they were rebuilt in the 1980s with different windows and brickwork. “[The uprising] was part of the breakdown of the prison and spoke to how poor the conditions had gotten in the 80s and 90s,” Perkins said as we examined a building that had been rebuilt after a fire. A prison cell at Lorton. Image by Melissa Robison licensed under Creative Commons. Inmates had attacked guards nearly 400 times in the preceding four years. The prison began swelling with inmates and 98% of the Lorton prison population was comprised of black men during the George H.W. Bush and Bill Clinton administrations, when the War on Drugs picked up in earnest. By 1995 Lorton was incarcerating about 7,300 inmates, 44% more people than originally intended. From 1995 to 1996, National Park Police had to airlift inmates to get medical attention more than 46 times. In 1995, Congress proposed HR 461, which called for the prisoners to be transferred and the prison to close. Though that legislation failed, another — the National Capital Revitalization and Self-Government Improvement Act of 1997 — succeeded. In 1997, the federal government took over and began the process of closing Lorton Reformatory. The last inmates were transferred in 2001. After 91 years, Lorton closed its doors, and the long road to redevelopment began. Stay tuned for the next part of this series on the Lorton Reformatory's transformation!